Seaventures dive resort is a very unique scuba diving destination located off the northern shore from Mabul Island in the region fondly knows as Semporna on the east coast os Sabah, Borneo. 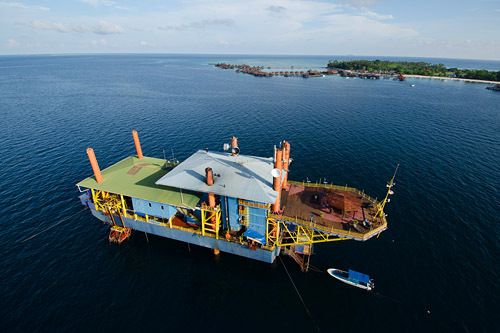 The resort is a converted oil rig support vessel. Ideal for divers whose objective is to scuba dive the region. 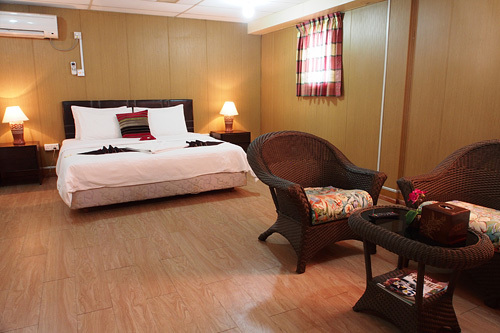 Great for budget travellers, we can offer one days guaranteed scuba diving at Sipadan with a minimum of four nights stay in a twin share room. Our online promotion offers the best value for money. However please contact us if you require a tailored holiday package. Select your trip start date and preferred stay duration below to book your Seaventures Diver Package. NO BOOKING FEE & NO CREDIT CARD FEES ARE CHARGED BY US FOR ONLINE BOOKINGS. Ex Semporna: Over the years we have spent many months scuba diving from Seaventures. 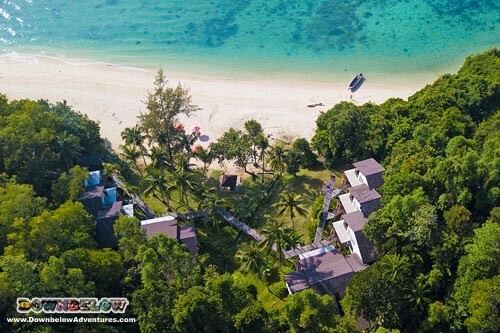 Its an ideal location for budget conscious travellers that want to maximise their diving in a world class diving region. 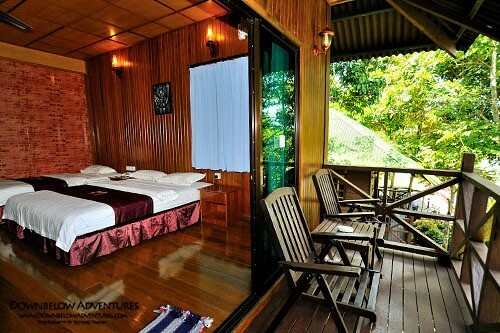 The resort itself is very unique and maintains the spirit of a working rig, yet the rooms are comfortable and the food is excellent. 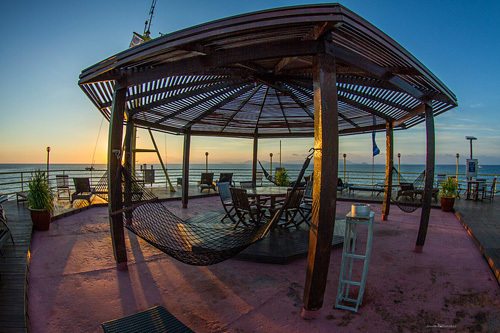 There is plenty of space for sunbathing and enjoying 360 degree stunning sunsets when you are not underwater. 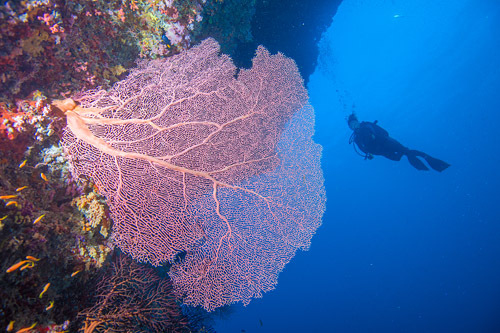 The rigs house reef is a superb dive site and on every “must dive” dive site list. 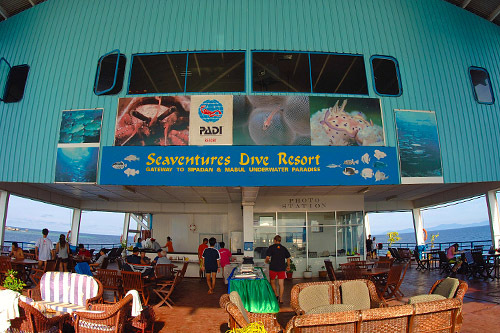 Guests of SeaVentures enjoy free unlimited house reef dives day and night and options for additional boat dives to Sipadan. However, we can offer a guaranteed one day of diving in Sipadan for a minimum stay of 3 nights in a twin share room under our Seaventures Diver Package. 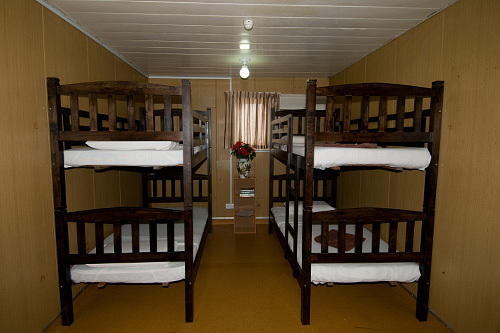 There are plenty of facilities on Seaventures to keep you entertained. There is a games room equipped with snooker, mahjong and table tennis and a conference room for screening videos or group meetings. Boats go across to the island if you want to take in a little of the local scenery and the resort have their own resident band for evening entertainment. Sipadan is world class and that always comes at a price. Its costly and unlike scuba diving TARP, there are a lot of divers in the water at the same time. It would be impossible to count the thousands of collective dives the Downbelow team have made at Sipadan over the years, but it has resulted in some amazing photography and knowledge. We have a dedicated page to Scuba Diving Sipadan and below we briefly describe 4 of the most famous dive sites. The wall was voted Best Shore Dive in the World by Roldales Scuba Diving Magazine. 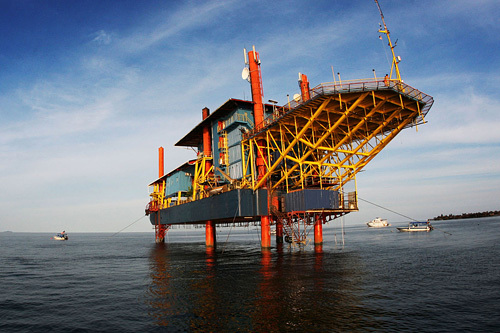 It’s a shear 600m drop to the ocean floor and starts just a few metres from Sipadan’s sandy beach. White tip reef sharks lay in small caverns and on ledges below with turtles lazily pass by. Schools of jacks, myriads of tropical reef fish, bumphead parrot fish and, if dived in the early morning, one may see a single or small groups of hammerhead shark. Generally the current is light here and the site is suited to all divers. The entrance to the Turtle Tomb Cave is slightly east of the jetty. At 18m it consists of a labyrinth of tunnels and chambers made famous in the 80′s by Jacques Cousteau. The limestone cave is the final resting place of numerous turtles who ventured inside, became disorientated and drowned. From inside the cave the entrance is marked by a blue hazy glow, making it appear mysterious and enchanting. The cave is an advanced dive and a guide is mandatory. A fantastic corner dive and arguably the best on offer at Sipadan. Good corals in the shallows slopes to sand and then onto the wall. One can hope to see schooling fish including barracuda and jacks and tuna. Grey reef shark, white tip shark and turtles mix with plenty of the other usual reef suspects. Currents are temperamental and the less experienced diver should stay with their guide. Located at the southern most point of the island, the sloping ledge of the islands reef is a textbook coral ecosystem. Suffice to say, schools of jacks, rainbow runners, turtles, white tip reef sharks, leopard sharks, the occasional thresher shark can be seen perusing the area. Strong currents are possible, but its generally a novice dive for those staying close to the reef. 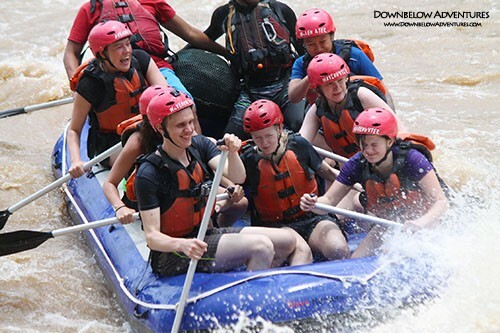 The Downbelow Price Promise: When booking your trips with us you can rest assured that you are getting the best value for money. Our packages are protected under our PRICE PROMISE. This means that if you can provide us with a bona-fide quotation from elsewhere, we will match the price providing the inclusions and standards of accommodation is the same. There is only one transfer to and from Seaventures daily. If your flight arrival / departure time does not fit well with these times then we can arrange and un-scheduled transfer which is subject to additional charges. 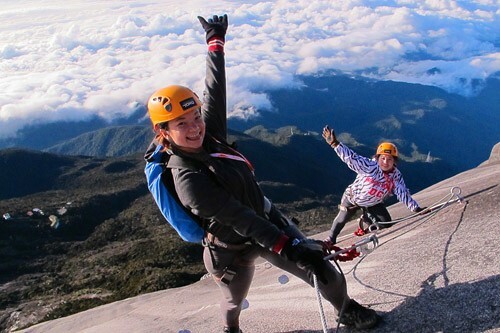 Please contact us to arrange your tailored itinerary. 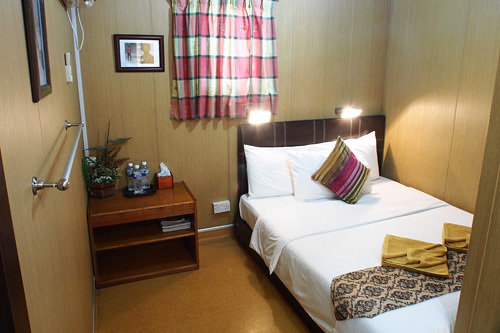 Pick up from Tawau Airport or your hotel in Tawau Town and land transfer (approx. 70 minutes drive) to Semporna Jetty. Guests can also be collected from your hotel in Semporna or meet one of the scheduled boat transfer times at Semporna Jetty. Board boat to Seaventures Rig which will take approx. 45 minutes. Arrive at Rig for registration, briefing and check in. Orientation Dive, if time permits. Overnight at the Rig. Meals Included:Lunch (for guests whom arrives on the scheduled boat transfer only). Dinner at Seaventures’ restaurant. 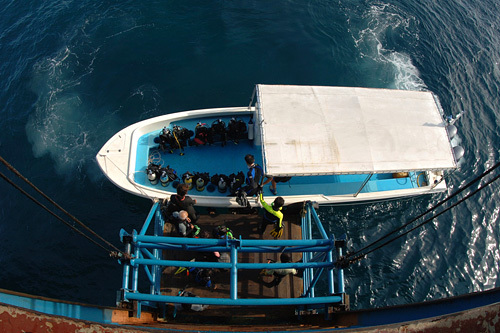 Diving Activity for Diver Package. Meals Included:Breakfast, Lunch and Dinner at Seaventure’s restaurant. *Diver Package : 3 boat dives between Mabul or Kapalai or Sipadan (refer important information tab) + unlimited house reef diving with buddy underneath the rig. **Diving in Sipadan is subject to permit availability and approval from Sabah Parks Management. In the unlikely event that permits to Sipadan Island are not available and/or approved, please take note that the package remains in force for 3 boat dives to be conducted between Mabul or Kapalai or nearby Islands. Free at leisure until departure boat times. Board scheduled boat back to Semporna Jetty (approx. 45 minutes boat ride). Take land transfer for drop off at your hotel in Semporna or drive about 70 minutes to your hotel in Tawau or Tawau Airport for your departure flight. Meals Included: Breakfast and Lunch at Seaventures’ restaurant. 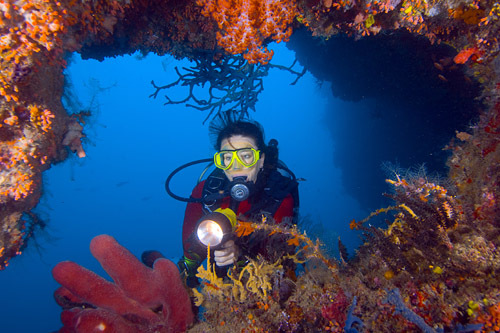 • Diver Package: 3 daily boat dives (excl. arrive &amp; departure days, unlimited dives in front of Dive Centre (for certified divers only), tanks, weights and belt. 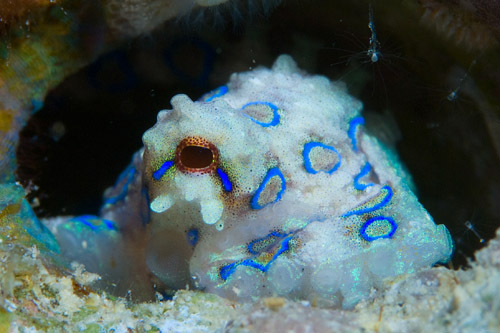 • Unlimited house reef dives. • No extra charge for night dives at the house reef (strictly for advanced / experienced divers only). • Usual resort clothing – casual, swim wear. 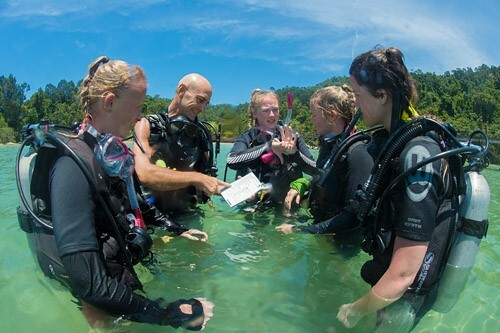 This package is for certified divers, and all dive programs are run by the resort. Our all inclusive packages include tanks and weights, but does not include equipment rental (see rental charges below), as many guests prefer to bring their own equipment. As an all inclusive package, 3 x boat dives plus unlimited house reef dives are included, but there are no refunds for unused dives. Snorkelers are permitted to snorkel around the resort at leisure. Snorkel equipment is available to rent or you can bring your own. 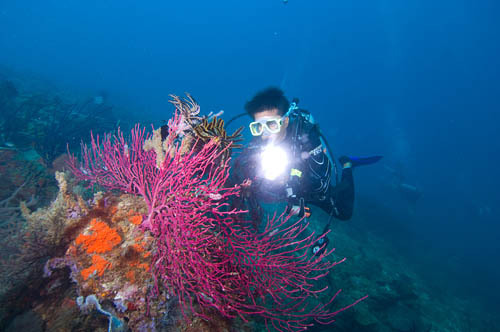 Daily entry to dive or visit Sipadan Island will be subject to approval by the Sabah Parks Department, which controls the issuing of the entry permits. The total number of divers or visitors allowed to visit Sipadan Island is restricted to 120 pax per day for all resorts in total. 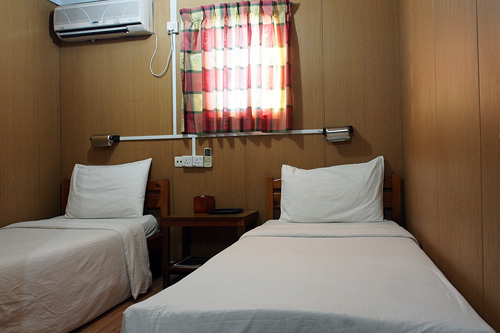 A minimum stay of 3 consecutive nights with a non-dorm room diving package is required to be eligible for a 1-day guarantee of a Sipadan permit. A fee is levied by the Sabah Parks Department of MYR 40 per person for all guests entering Sipadan and is valid for ONE (1) day only. In any event the trip has to be cancelled, the permit paid is NOT refundable or transferable to a later date. The management will not be responsible for such losses rendered to the guests. Please note that we will forward your name for Sipadan permits as many times as possible. Please inform us if you do not want to be put forward for more than your guaranteed allocation of permits at least 24 hours in advance otherwise you would be charged for the permit acquired. IMPORTANT NOTICE: Due to the conditions of the Sipadan entry permit quota set by Sabah Parks, guests are required upon booking to submit full name with nationality, gender, passport numbers and contact address for us to proceed with the permit application. 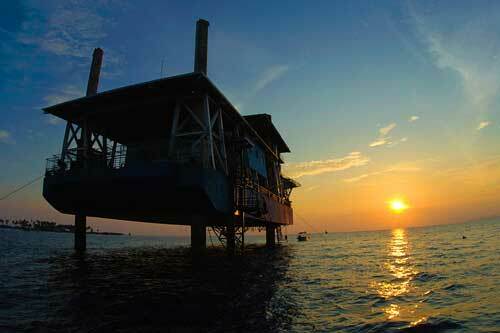 Failure to submit information may result in guest(s) being denied entry to Sipadan Island. Any charges incurred at the resort are subject to 6% GST.Due to weather conditions, activities may be subject to re-scheduling to best meet operations, as well as clients health and safety. Marine life cannot be predicated nor guaranteed because it is a spontaneous chance to spot any in their natural rainforest habitat.